We are so proud of you Charles! 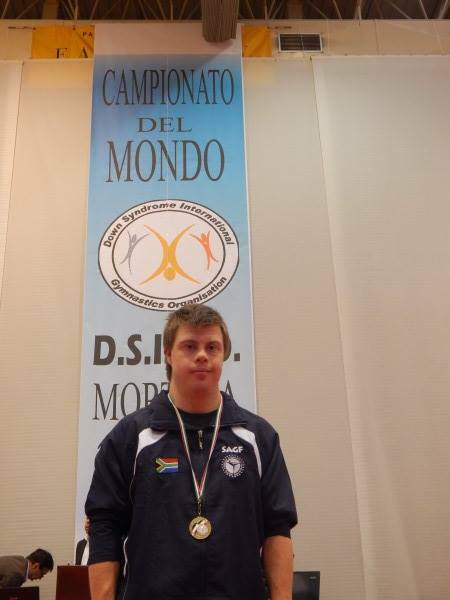 Charles Phillips from KZN/Pinetown Gymnastics Club with his bronze medal for his Senior MAG H bar routine which was won at the World Down Syndrome Championships held this past weekend in Mortara , Italy. 9 countries participated in the men’s artistic competition which was eventually won by Andrei Vostrikov from Russia fresh from his win at the Special Olympics event held in Los Angeles in July. Charles and coach Allan Chadwick have been training diligently since Charles’s selection at National Championship earlier this year and the entire MAG community is proud of his efforts and continuing improvement. Many thanks to the Department of Sport & Recreation – KwaZulu Natal who funded the trip.